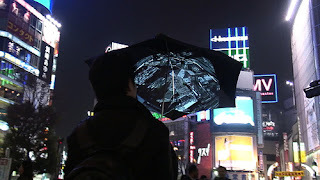 "Pileus is an umbrella connected to the Internet to make walking in rainy days fun. Pileus has a large screen on the top surface, a built-in camera, a motion sensor, GPS, and a digital compass, and it provides two main functions; a social photo-sharing and a 3D map navigation." What kinds of ads would work on this situational display? Exotic cruises to sunnier places? Aspirin?